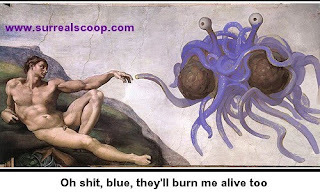 Followers of the Flying Spaghetti Monster today petitioned the United Nations in the hope of getting their irrational fantasies protected from people who may say something rude about them, such as it is all a load of made-up nonsense. The green colouring in the images, described at the time by the editor of “What Deity?” as “a printing error”, led to six days of rioting on three continents. Many Italian restaurants had to placate the mobs carrying huge pasta forks by promising to never use pesto in combination with pork on the third Thursday of the month unless it is the 5th serving. The followers of the Spaghetti Monster wish to have a UN declaration on “Saying anything uncomplimentary about things that can never be proven” and thus, by ratification of member states, a world-wide law making blasphemy, and the use of ketchup, illegal. However there are many in the rational world who believe that the credulous should not have any control over opinion, intellectual debate, or the representation of non-corporeal entities that are easily confused with fiction created to keep children in check.